Named for a bitter saline spring, Epsom salt naturally occurs as pure mineral compound of magnesium and Sulphate. Epsom Salt is long known for its benefits as a natural remedy for several aliments and also comes with numerous health benefits which also include garden-related, household and beauty uses. And as studies have shown, sulphate and magnesium can readily be absorbed into the body through the skin thereby making Epsom salt baths an ideal way of enjoying these health benefits. Sulphate specifically helps flush toxins from the body, improves the absorption of nutrients and also helps ease migraine headaches. Magnesium on the other hand helps regulate the activity of over 325 enzymes in the body, preventing hardening of arteries, helping muscle and nerve functions and also reducing inflammation. 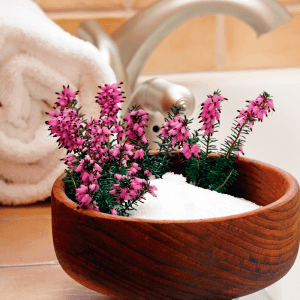 What Are The Holistic Benefits Of Using Epsom Salt? For hundreds of years now, Epsom salt comes with beneficial health properties unlike other salts and therefore soothes, the body, mind and soul. The salts has numerous holistic benefits some of which include treating cold and congestion, easing muscle strain, healing cuts, cursing skin problems, relaxing the nervous system, removing toxins from the body, soothing back pain and aching limbs. The salt also helps ease stress and other stress-related problems. How does Epsom Salt Ease Stress And Relax The Body? Stress usually drains the body of its energy which them magnesium increases the adrenaline levels. Epsom salt can however reverse this condition. When dissolved in warm water and absorbed through the skin, it helps replenish the level of magnesium in the body. Normally, proper levels of magnesium in the body helps produce serotonin which is a mood enhancing chemical within the brain creating a feeling of calm and relaxation. Studies also indicate that magnesium increases energy and stamina by encouraging production of adenosine triphosphate (ATP) which are energy packets within the cells. Bathing in Epsom salt at least twice weekly is believed to help you gain more energy, feel and look better. The magnesium ions in the salt also play a key role in reducing irritability since they lower the effects of adrenaline giving you a relaxed feeling, improving your sleep and concentration and also helping your nerves and muscles to function properly. How does Epsom Salt Relieve Pain And Muscle Cramps? Epsom salt is also beneficial in treating migraine headaches, bronchial asthma and sore muscles because it can relieve inflammations and ease pain. A thick paste of the salt mixed with hot water is also known to heal cuts and reduce soreness from childbirth bringing a soothing sensation. For aching and even smelly feet, the salt is a good remedy as it softens the skin and neutralizes the foot odor. How does Epsom Salt Help Muscles And Nerves Function Properly? Researches also show that Epsom salt helps regulate electrolytes in the body by ensuring that the nerves, muscles and enzymes in your body are functioning properly. The magnesium in the salt is also important as it uses the calcium which usually serves as the main conductor of electric impulses in your body. How does Epsom Salt Prevent The Hardening Of Arteries And Blood Clots? Epson salt improves the blood circulation, prevents blood clots, reduces the risk of sudden heart attack deaths and also protects the elasticity of the arteries. This is what makes it a key ingredient in improving your heart health in the process also preventing heart diseases ensuring that you don’t get strokes. How does Epsom Salt Make Insulin More Effective? The proper levels of sulphate and magnesium in your body increase the effectiveness of insulin which helps to lower the risk of diabetes. If you are diabetic, Epson salt will also help lower its severity. How does Epsom Salt Relieve Constipation? According to numerous studies, Epsom salt can also be used to treat constipation. Especially when taken internally, it acts as a detoxifying agent for colon cleansing. The salts works like a laxative that increases water in your intestines bringing about temporary relief from constipation. You should however consult a doctor first before you administer Epsom salt to relieve constipation. How can Epsom Salt Eliminate Toxins From The Body? The use of Epsom salt also helps the body to get rid of harmful substances. This is mostly due to the presence of sulphates that flush out toxins and heavy metals from the cells which ultimately helps ease muscle pain. This occurs in a process referred to as reverse osmosis triggered by your skin which is a highly porous membrane. Adding the right minerals in your bathwater and in this case the salt, speeds up the process pulling excess salts out of your body and harmful toxins along with it. For a rewarding detoxifying experience, add 2 cups of Epsom salt in your bathwater and soak in it for 10 minutes at least once a week. What Are Some Epsom Salt Uses? Whether you want to enhance your beauty effortlessly or just have a relaxing bath, you can make Epsom salt part of your daily routine and experience the goodness that it offers. By just adding 2 cups of Epsom salt in your warm bathwater 3 times per week and soaking in it for not less than 12 minutes, you will experience numerous holistic benefits and a wholesome stress-relieving experience. To moisturize your skin effectively, add a cup of olive oil into your bathwater that already contains the salt. However, don’t use soap as it will interfere with the action of the salts. Then rest for 2 hours afterwards and in case you have arthritic joints, move them up as much as possible after the bath to prevent congestion in the joints. When using it as foot bath for your weary feet, add a cup of the salt to a basin of warm water. Then relax and soak your feet for 20 minutes and if you have calluses on your feet rub them away using a pumice stone. Then dry your soaked feet and then add 2 drops of peppermint oil to your natural moisturizer and rub it thoroughly on your feet to lock in the moisture. Generally, Epsom salt has numerous holistic uses and also acts as natural remedy for many ailments. Pregnant women or those with health concerns should however avoid using this salt unless a qualified and certified physician allows them to do so.